Thanks for your long time support of our organization. You are all invited to join us for our 30th anniversary celebration on Friday, October 14, 2016. Whether or not you can be with us in person, we welcome your thoughts. Please feel free to share your greetings, memories, or other comments, which will be shared at our celebration. RSVP information is below. If you wish to send Anniversary Greetings, please post HERE. We are very excited to announce our upcoming 30th anniversary celebration! 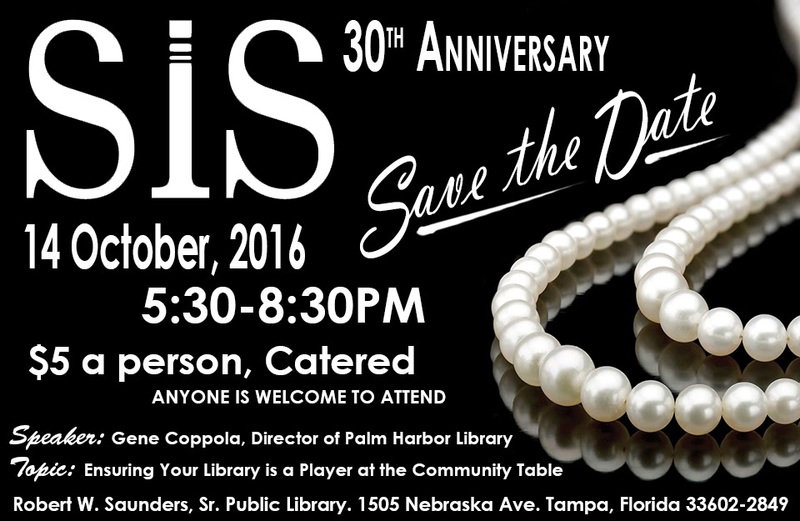 We hope all who have made SIS such a long-running success will save the date for Friday, October 14th from 5:30-8:30pm at Robert W. Saunders, Sr. Public Library. Our speaker for the evening will be the Director of the Palm Harbor Library, Gene Coppola. All members, past, present, or future are welcome to attend! As always, guests also welcome. Hope to catch up with all of you while we reminisce and look toward the future! Gene Coppola was born in Manhattan and attended Iona College, where he received his BA in English Lit. and Classical Civilization, and St. John’s University (where he acquired his Master’s Degree in Library Science). After six years with the Brooklyn Public Library, he moved to Florida in 1990 and became a Branch Manager for the Pasco County Library System. In 2000, he became the Director for Palm Harbor Library, and serves on the boards for FLA and TBLC. In fact, he is currently FLA's Immediate Past President. Gene loves the Yankees, art, theater, and books (of course!). For questions regarding the program or to change your RSVP, contact Jenny Tolbert <thebookishbull@gmail.com>. Deadline is Friday, Oct 7, 2016.